Liberal is a diverse community with a wide range of entertainment for all ages. Known for Dorothy’s house and the International Pancake Hub of the Universe, Liberal has much more to see and do! Visit one of our fine museums or watch one of our finest concerts. Liberal is a great place to visit and has attractions for all ages! L.I.V.E ON STAGE, The Southwest Symphony, Liberal Community Concert Association, Seward County Community College Theater, and The Baker Arts Center emphasize cultural entertainment on the High Plains year round. Check Liberal’s Community Calendar for the next upcoming event. On every Shrove Tuesday, women put their scarves and aprons on to ready themselves for the race. With their skillet in hand and a pancake to flip, the ladies start the race against Olney England in the International Pancake Race. Visit the Pancake Hall of Fame and see how it all began. 2014 Celebrates the 75th anniversary of the Movie, “The Wizard of Oz”! 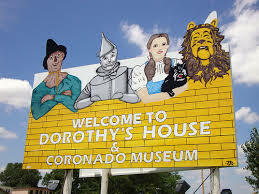 Celebrate by visiting Dorothy’s House. It’s located where else than on the Yellow Brick Road. Every other year the Museum hosts Oz-fest with fun for all! The Coronado Museum is a great place to learn more about Liberal’s history.